I’m not really sure what drew me to sign up for The Fling, a 53 mile race from Milngavie to Tyndrum along the West Highland Way, considering I don’t do a lot of local races, preferring to race abroad, and also that the WHW is part of my regular training run but for some reason I was drawn to ticking this off my ever growing list of must do races. The race came around quicker than I had hoped. The start to the year had been more hectic than I planned; starting a new job with Village Hotel Edinburgh along with finally having Dion and Gobi home from China (see Finding Gobi for more on this adventure); all of which I’d imagined as being the start to a new ‘routine’, a steady state of life to crack back on with training and life in general. As they say about the best laid plans….exactly that! Life was far from routine. It took a couple of months for Dion and Gobi to find their new rhythm alongside Lara and I, and amongst it all both Dion and I were finding it hard to sync our training around the demands of our new girl Gobi and their subsequent book releases, which resulted in more days out having a walk and finishing at a cafe or pub rather than putting in the required training. 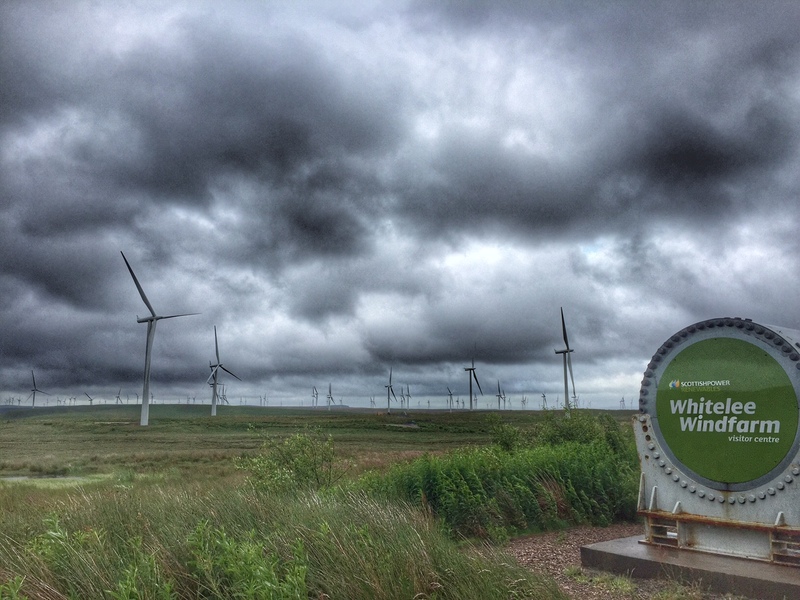 Not that the weather helped either mind you. I try to be hardy but I’m a fair weather runner at heart. I had glimpses of getting back to training properly with a few solid mileage weeks and making good use of my new run commute into my amazing new gym (a perk of the job) with a strong focus on building strength in my legs and glutes with the aid of my PT. 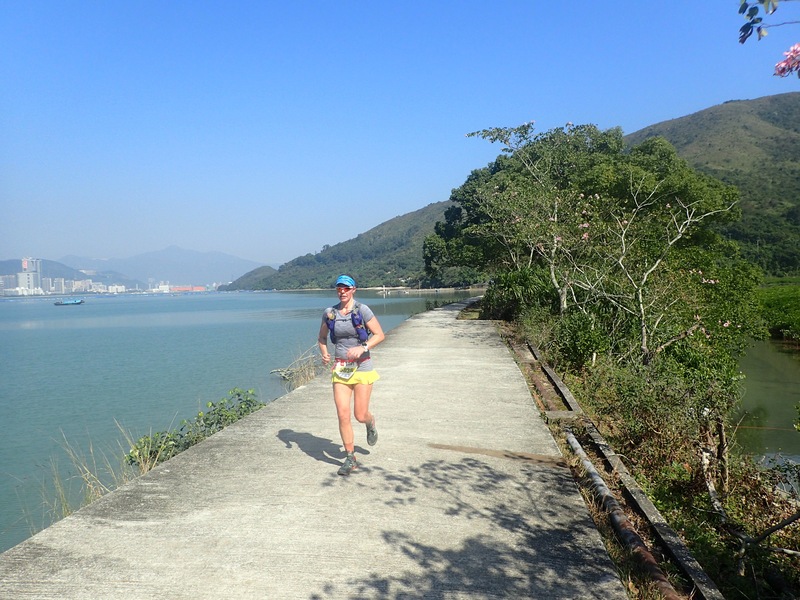 My PT Huw has got me strengthening the key muscles to make me a stronger mountain and endurance runner and I can certainly feel it has been working. A lot of work on single leg exercises, deadlifts, squats, lunges and a combination of upper body has made my body hurt in ways I didn’t know possible but it has reaped benefits. My legs felt strong throughout the race and I was out doing a recovery hike the following 2 days which certainly is testament to stronger muscles. When I’d signed up for the race in late 2016 I’d envisaged my training going so well I’d be aiming for a sub 10 hour finish but as race day approached I knew this wasn’t realistic and had revised back to a sub 12 hour finish. Through the positivity of Dion and a visiting friend Euan, we revised this to still push for 10 and see where it took me. My ultimate goal is to finish feeling strong and with a smile on my face. Rhianon, me and Em at the start line, all smiles. Race day! 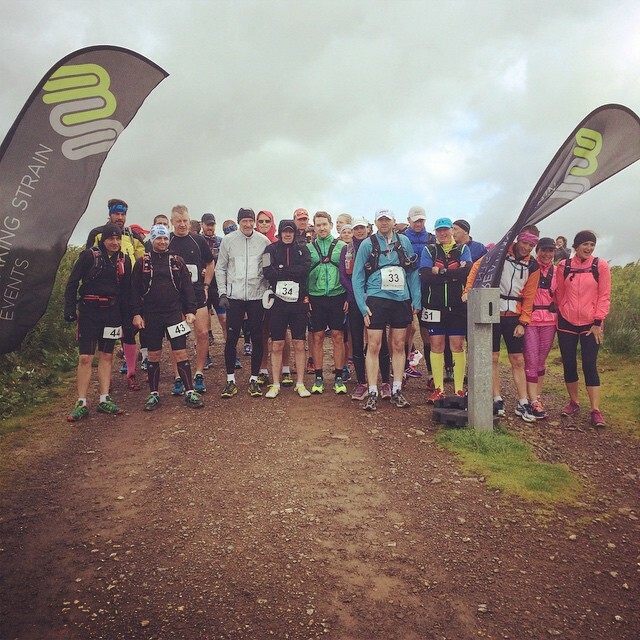 Milngavie only gets this busy twice a year, at Fling time and of course for the West Highland Way race which takes in the full 97 miles of the route. Out of the 1,000 runners congregated I felt like I knew most of them so there was a lot of pre race chat as we gathered to head off. I started off way too fast, chatting with a pal Em before she pushed on and I dropped back to a more sustainable pace. Glad I did when I later found out Em had finished in 9hrs 42m! She was on top form, well done to her. 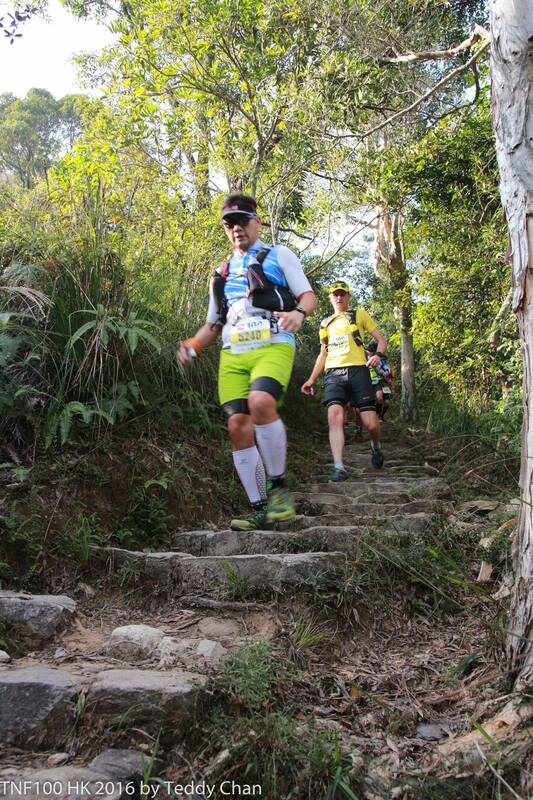 The first 19 miles of this race are hard to hold back on as it is very runnable and mixed with the adrenaline of a race can be a dangerous mix. I was excited to reach Balmaha and see Dion to refuel and swiftly carry on. 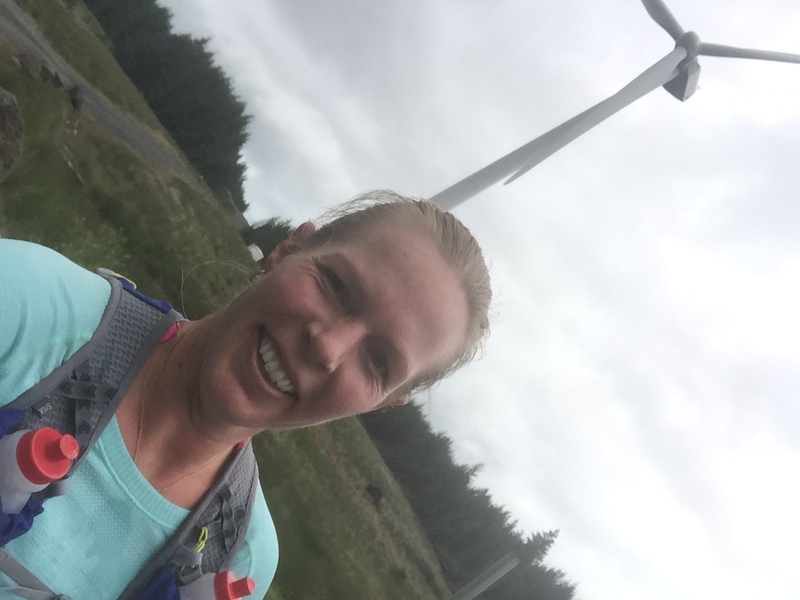 I felt strong coming into Rowardennan which was the halfway point, one marathon down, just one to go 😉 my feeling of contentment was shattered soon after as I was enjoying a little jog out of the checkpoint drinking my coconut water and tripped! Bruised ego and blood ensued (just a minor cut on my palm) but back into it. 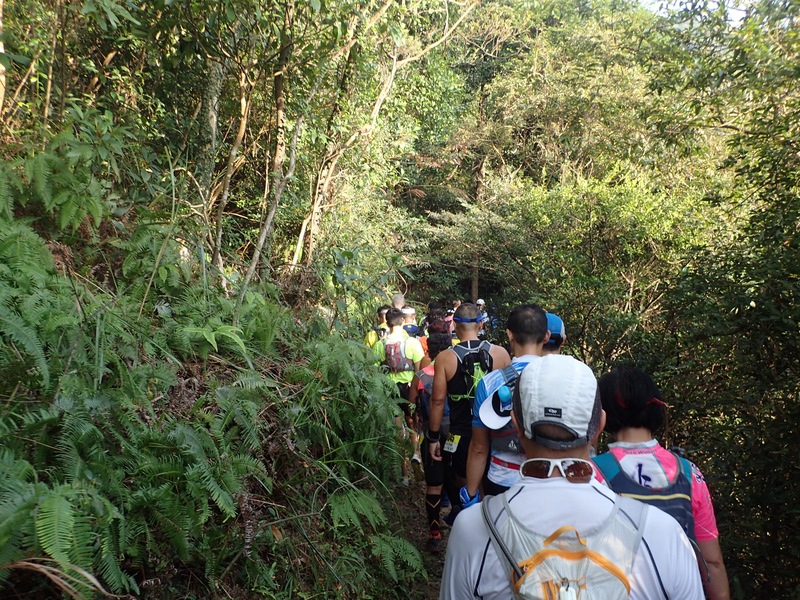 From here the route gets a bit more technical and with a marathon already under your belt the pace tends to drop as everyone is taking a bit more care through this section. Reaching Bein Glas I am lifted by the sight of not only Rhianon holding one of her infamous motivational signs and cheering but she’s even managed to get Dion to hold up a sign! After a quick lick for good luck from Gobi I’m off again. There’s just half a marathon to go and this is the stage I know I just have to dig deep and get it done. 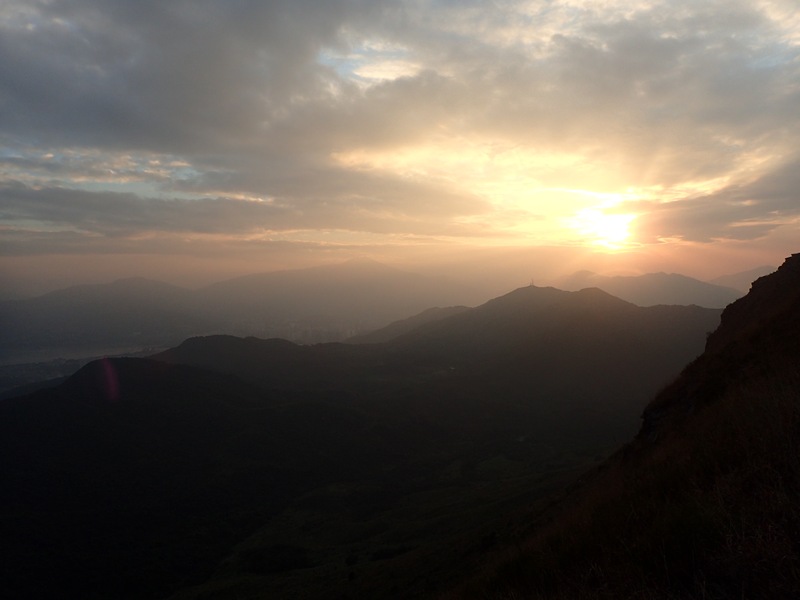 The legs are fatigued, feet a little sore and I’m feeling quite sluggish not long after I leave the checkpoint. It’s a tough slog through cow pat alley before I reach Crianlarich hill where my lovely support crew are along with the wonderful Beardy and Blondie, it’s a party atmosphere on the hill giving my spirit a boost before the last final climb. It’s a slow climb up and the rain starts so I faff around putting a jacket on as my body is now fatigued I immediately feel cold. The descent over the other side is hard work on the quads (more work needed on those) but I’m rewarded with a surprise crew cheer spot just before Auchtertyre by Dion and Rhianon hiding out in a farm shed. I’d realised just before reaching there that with only 3 miles left to run, if I could maintain 10min/mile I could make it in 11 hours which spurred me on so much I don’t think I let my excitement of seeing them show enough as I just ran straight through! 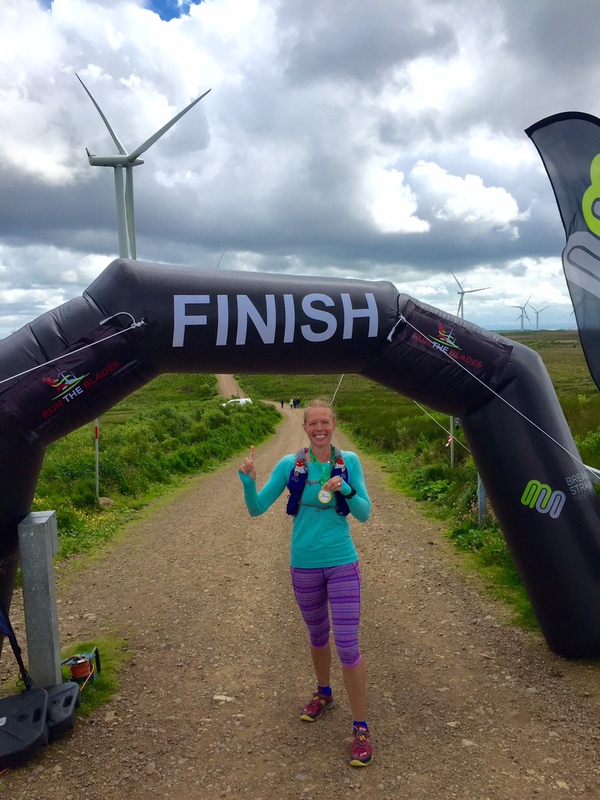 As I come towards Tyndrum the sound of bagpipes fill the air followed by the ringing of the cowbells; the finish line! It’s here! I’m still running and I’m smiling and I’m finishing in 11 hours! 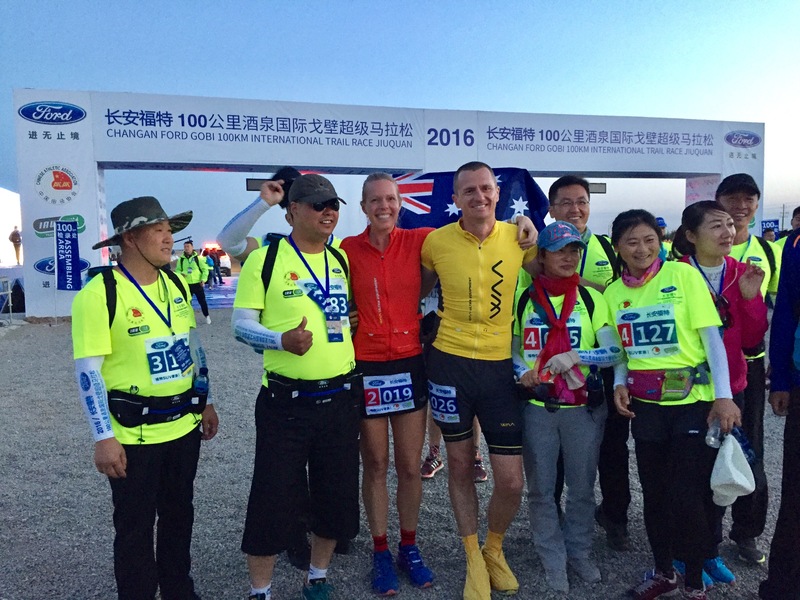 I hit the red carpet to the cheers of the crowd, including Dion, Gobi and Rhianon and the finishers medal is mine. My mind & heart had finally made a full recovery after some life changes including leaving my job and adjusting to life with Dion, my husband, living away in Beijing until the new year -Read more about his incredible running journey with GOBI stray desert dog at http://www.findinggobi.com. My legs were another story. I was desperate to be running again but every time I headed out for a run my knee was causing me a lot of pain and I felt like I was running with concrete blocks for legs. 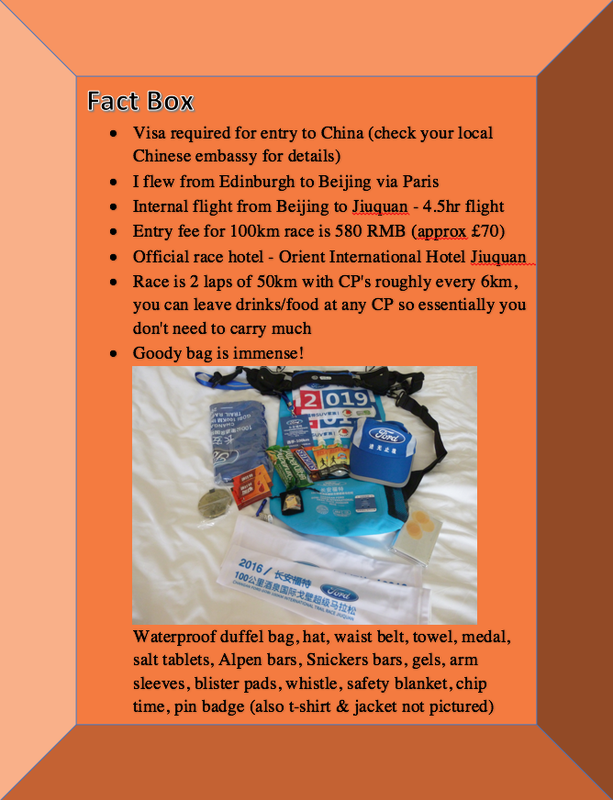 Having received an invitation to run the Changan Ford Gobi 100k International Trail Race Jiuquan, China; I couldn’t pass up the opportunity, although I knew full well that it wouldn’t be easy or particularly pretty. The principal of recovery dictates that athletes require time to recuperate from training and racing. Rest and recovery not only gives bodies the chance to adapt to the stress placed upon them during racing or intensive training but also for mental preparation and reflection. I am always a big advocate of rest periods, dismissing the popular ‘active rest’ that others seem to enjoy, and to date this has kept my body and mind fresh and injury at bay. But my last adventure #500kin5days had really taken it out of me, as noted by my DNF at Ultra Trail Mont Blanc only 4 weeks afterwards and subsequently still felt the effects at the Gobi 100k. The city of Jiuquan is in the Gansu province which is synonymous with the Silk Road where goods once streamed between China and Central Asia. This constant flow of trade left Buddhist statues, beacon towers, forts and chunks of the Great Wall in its wake and its diverse landscapes include parts of the Gobi desert. This was my first opportunity to visit the Gobi desert where my husband Dion, met Gobi the wonder dog who joined him on a 6 stage ultra marathon across the desert and is now to become part of our family with us all being reunited on January 2nd 2017. 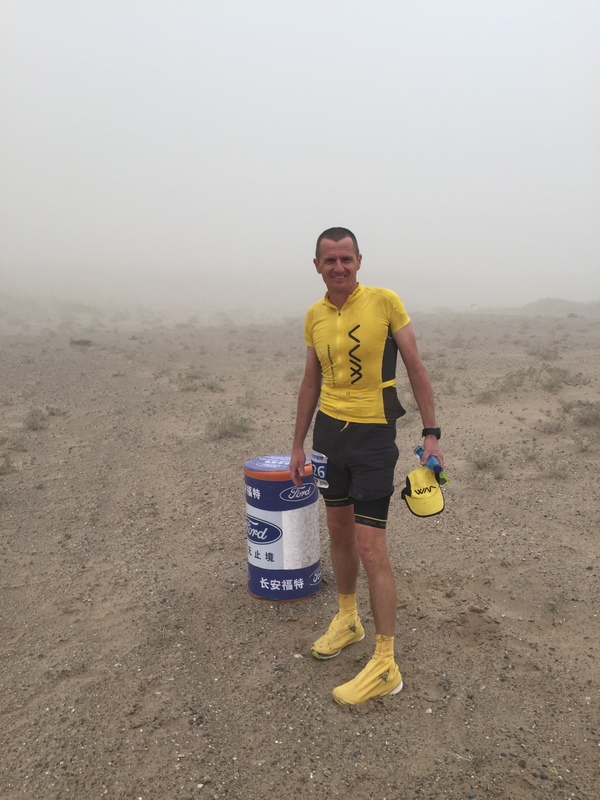 Being able to experience running through the Gobi desert, albeit in a different location to the race they ran, was a great experience to understand when Dion talks of his experience with Gobi and made me feel more closely connected to them both. The fun part of travelling is culture and language and China has this by the bucket load. Exploring the city on foot we discovered a stunning local temple where in the perimeter local Chinese danced and a calligrapher was painting the most beautiful symbolic banners. 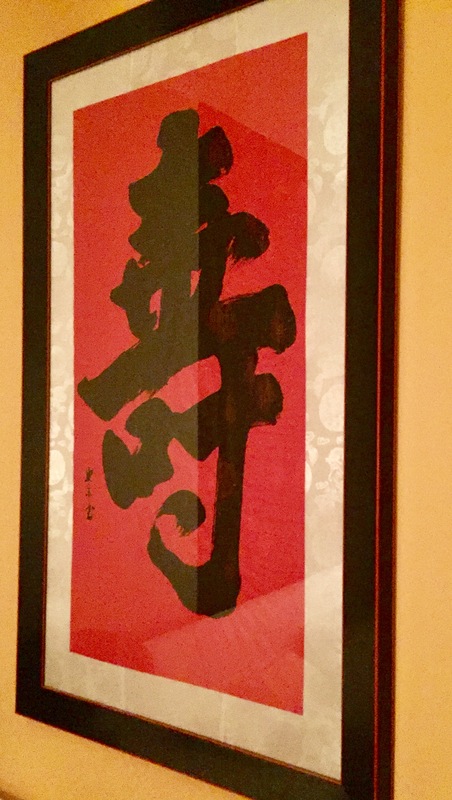 Through hand signals and google translate we arranged for him to paint us our very own artwork with the symbols standing for ‘Longevity’. I had this framed at home using the white Khata’s we would later be presented with to showcase this amazing art & experience. 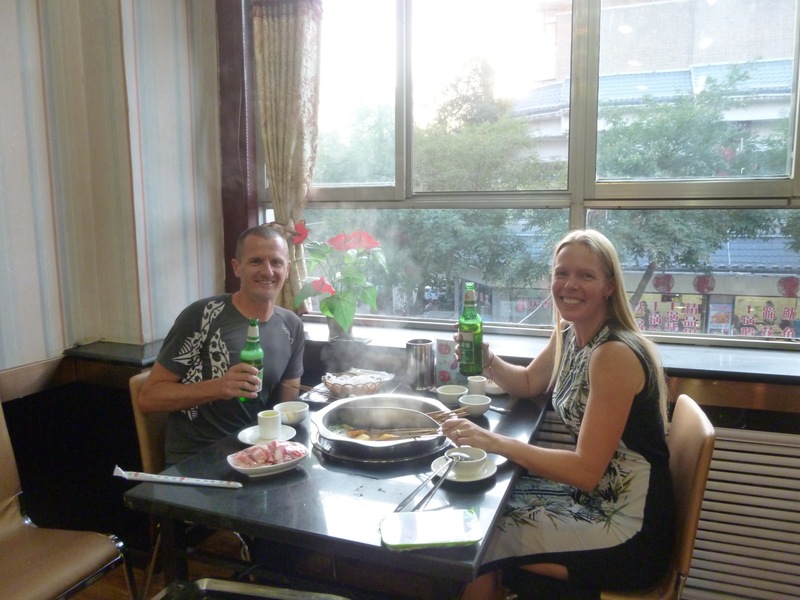 The food of the province was hot pot with every restaurant having this on offer and we treated ourselves to a feast of meat, vegetables and quail eggs which we poached in a choice of boiling broths on our table. The fun in choosing items from a menu in only Chinese was not only entertaining to us but also the other visitors of the restaurant. Not our normal pre-race food of choice but absolutely delicious. 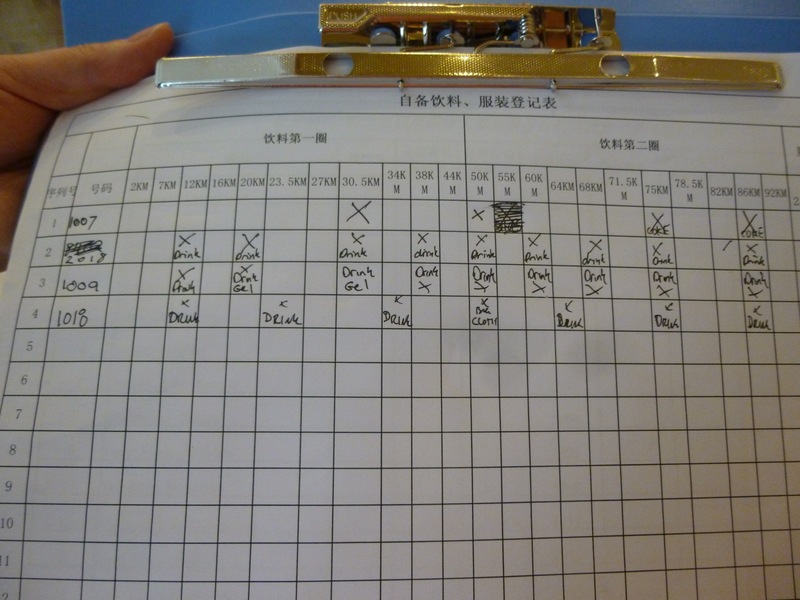 The inaugural 100km race had the IAU (International Association of Ultrarunning) badge which was very significant as previously China was unable to badge their races as such and to signify the importance of this occasion, both the IAU President, Dirk Strumane from Belgium and IAU Honorary member Souhei Kobayashi from Japan were both in attendance. I had the good fortune of running into them at Beijing airport and forged a friendship over coffee. A host of elite runners had been invited to help build the profile of the race and it was an honour to be included in this experienced field of almost 200 runners. We attended the press night and were treated to a VIP Chinese welcome with singers, presentation of a Khata (traditional ceremonial scarf popular in Buddhism made of white silk to symbolise the pure heart of the giver) followed by dinner alongside the lake complete with lighting of floating lotus flowers for a truly authentic experience. 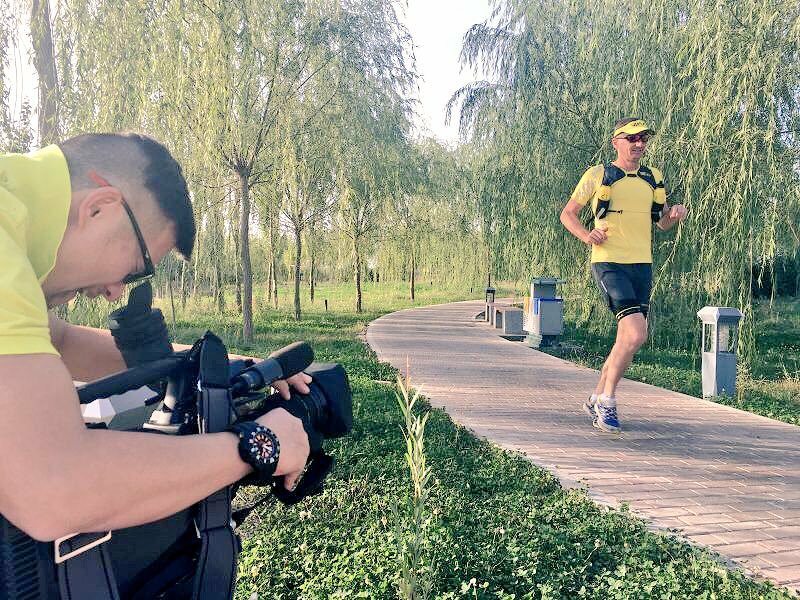 The race has 2 distance options; 20km or 100km (2 laps of a 50km route), starting at Xintiandum Farm North crossing through various landforms such as Gobi desert sand and grassland passing through Tianluo Ancient City and Huacheng Lake with a maximum ascent and decent of 488 metres. Under normal conditions I should easily have made the cut off time of 14 hours, but as anyone that runs knows; always expect the unexpected. Drop bags available all along the route which is fantastic! Shuttle buses collected us bright and early from the hotel to deliver us to the start line 45 mins away the following morning ready for our 7:30am start. In between preparations for the race I was constantly posing for photos with the Chinese runners, being a 6ft blonde certainly caused more than my share of attention, one of the race officials acted as my bodyguard and was conscious to stop the crowds developing around me even though I was loving it, feeling like a complete celebrity star with all the attention and photographs. As part of the elite runners we had our own separate warm up area and we were ushered to the front of start line. The sun was beginning to rise and you could start to make out the vastness of the Gobi desert in the horizon. 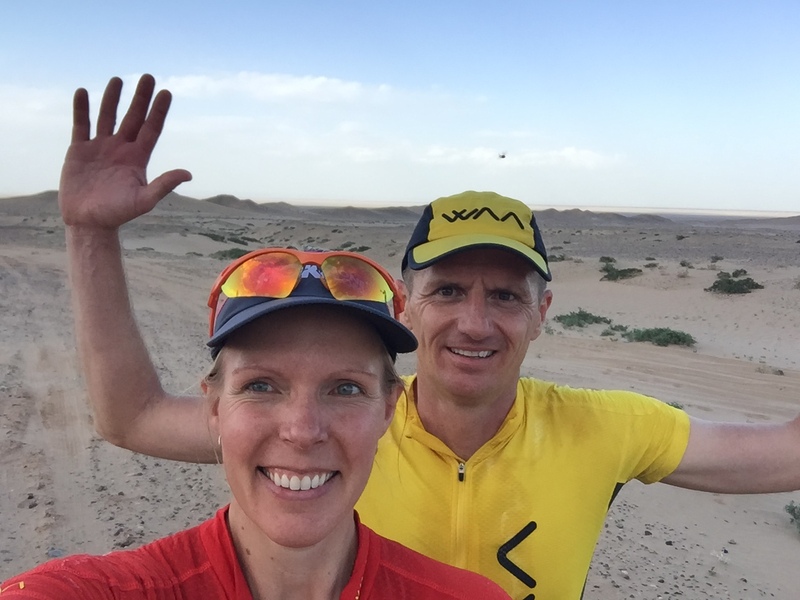 As the countdown ended the start was signified with a dazzling display of coloured fireworks blasting high into the air right beside the start chute as we ran into the sand of the Gobi desert. The sound was deafening and the lights and colour added to all the excitement. It was a quick start with some of the front runners expected to be in around 7 hours and the pack quickly spread. Dion had promised to stick with me for this race as he knew I wouldn’t be able to make this one alone, most likely a promise he now regrets. Conditions were reminiscent of Marathon Des Sables, trudging through loose heavy sand in overbearing heat. 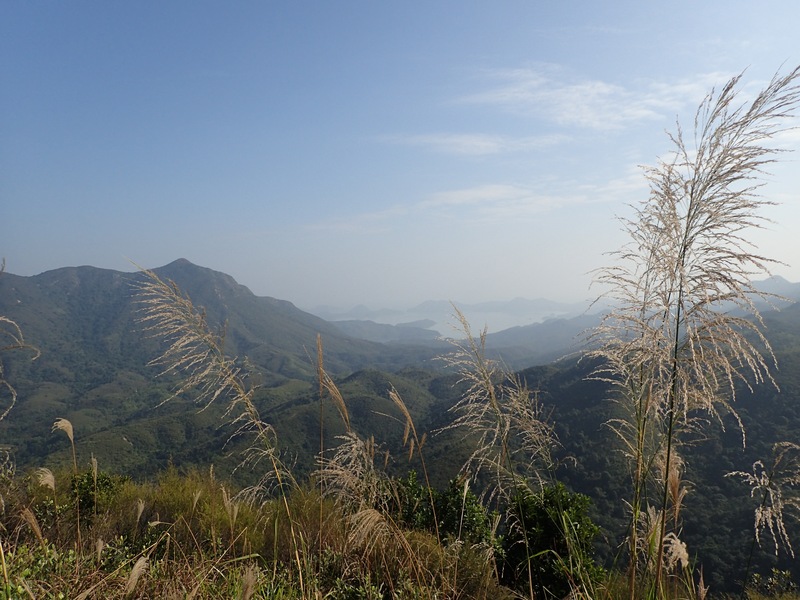 The tempered conditions quickly escalated into near 40 degrees Celsius and there was not a scrap of shade in sight. 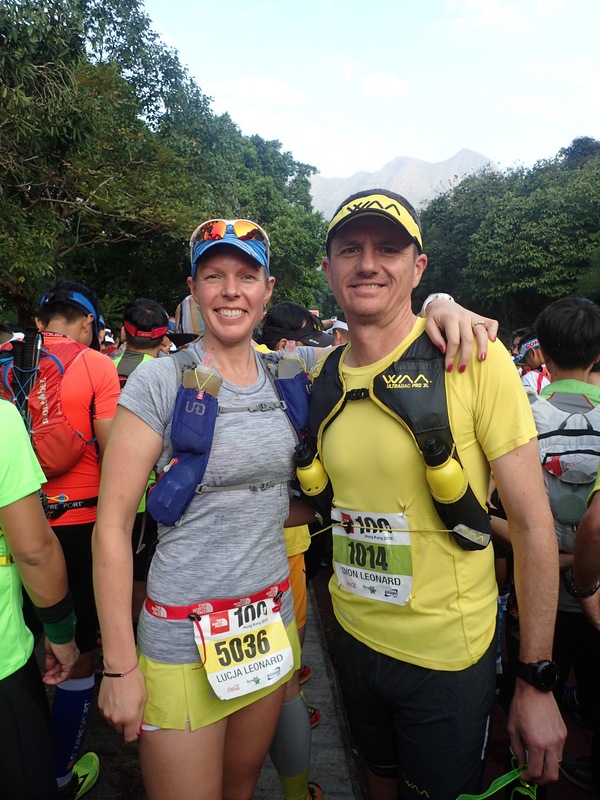 Although my pace and stamina were suffering we were passing others that had begun to slow noticeably from 30km and strong experienced runners were dropping out already even before reaching the 50km turnaround point; the race was tougher than any of us had given it credit for. Reaching the 50km point after 6hrs, later than the 5hrs we had anticipated, it was a challenge to get out of the checkpoint tent as it was now the hottest part of the day and knowing that we had to head back out and complete another 50km through the same route was a mind game. I offered Dion the chance to leave me here and carry on but he encouraged us on, owing it to the race organisers to see this through to the finish. Making our way through the 2nd lap with the oppressive heat my body began to rebel, with every gel I swallowed to try and gain some energy I would buckle in half and throw it all back up with some horrendous stomach cramps to go with it. The heat was so unrelenting that we took a 5 minute pause in some shade caused by the sun shifting position behind a sand dune giving us a brief respite to get ourselves right again. We watched as the light around us became hazy and an orange cloud of dust enveloped us in an almighty sandstorm reducing visibility to 10 metres at most. With visibility so low we came close to having to stop & wait the storm out but we were just able to continue on, though at a very reduced speed as the sand whipped up into our eyes and the strength of the wind held us back. What doesn’t kill you makes you stronger, right?! 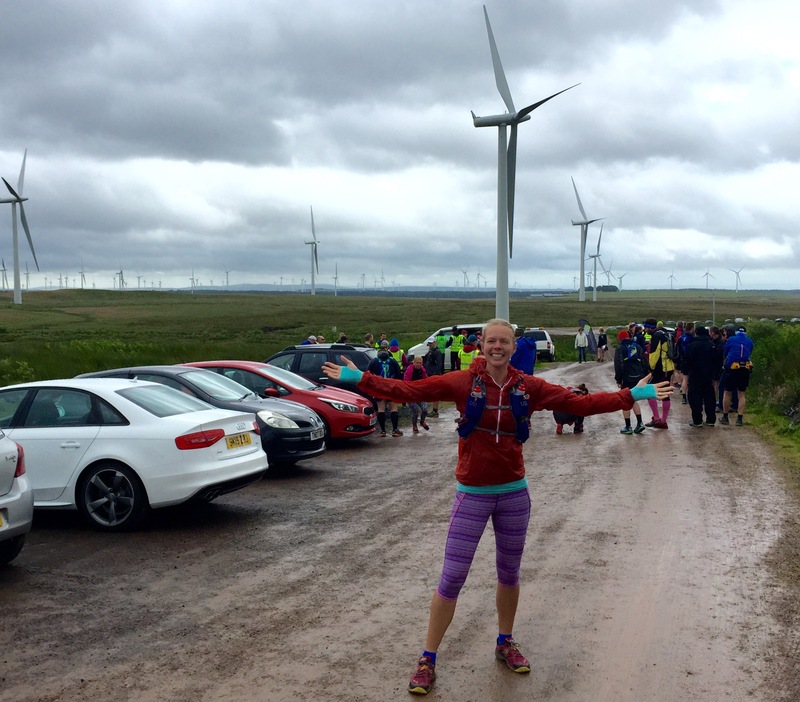 We later heard that other runners had been pulled from the course due to safety issues but we passed through what was left of wind strewn checkpoints unchallenged. 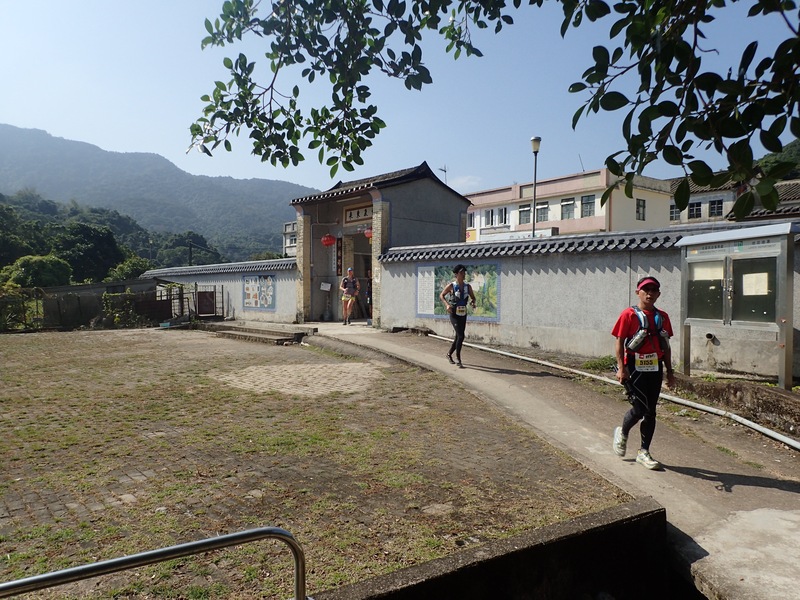 We were pushing, up against it to get me to the finish line and we formed a band of merry men as we joined up with 5 Chinese runners and pushed each other on to reach the finish line. It was a surreal experience over the last 3 miles as we were followed to the line by the support vehicles lighting the way. 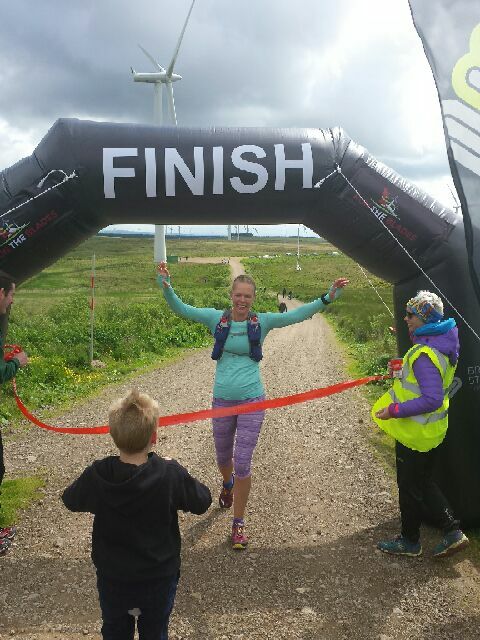 13 minutes before cut off and we made it, coming in as 15th female, the last female to finish for the day out of the 29 that had started. This showed true grit & determination that was displayed throughout the day, pushed on by Dion’s coaching along the way leading me to dig deep and carry on to get it done. 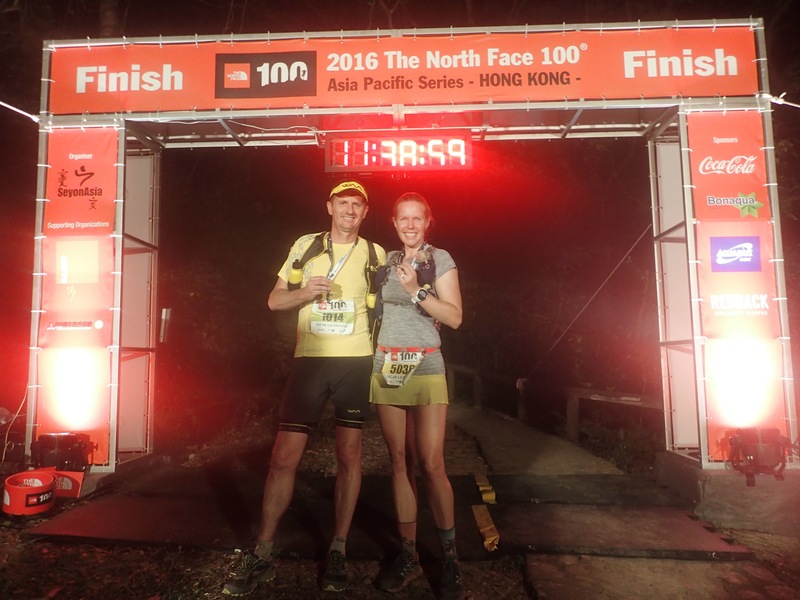 Although an unexpected 100km for me, the race delivered an unexpected tough challenge to many as shown in the results with the high number of DNF’s (Did Not Finish). Whilst I would never recommend pushing your body so much as I have in the year, the experience surpasses the extended recovery I have now had to take. 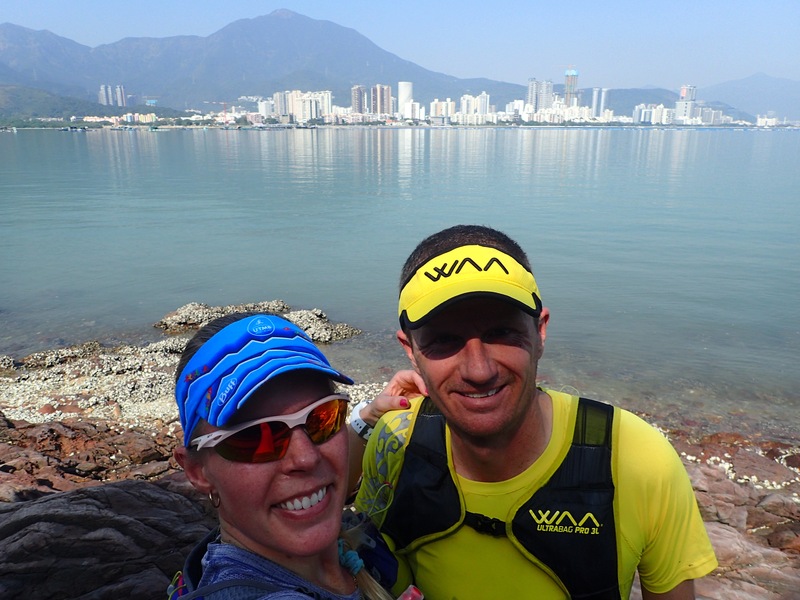 China is opening itself up to the world and running is taking off full speed ahead with many new races hitting the calendar with some spectacular location to run. 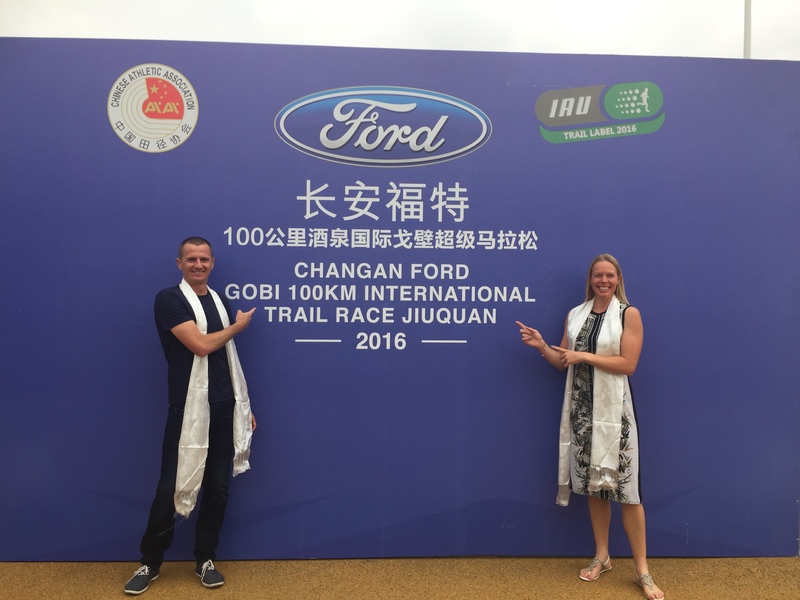 I feel privileged and thankful to Changan Ford for supporting this event and hosting us in such a hospitable manner, especially to Tao, who worked tirelessly to look after us like superstars. 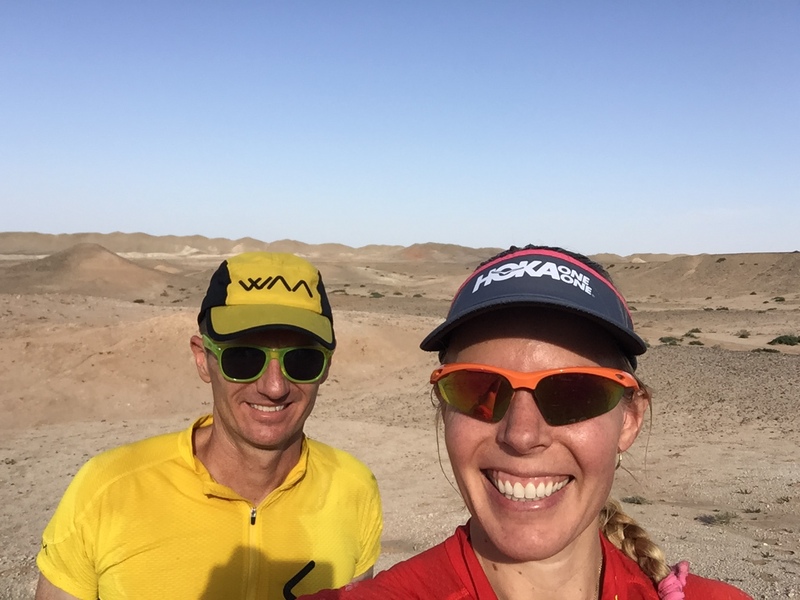 If you are looking for a race that is going to challenge you and give you the opportunity to run in one of the world’s greatest deserts in some serious heat, then look no further.